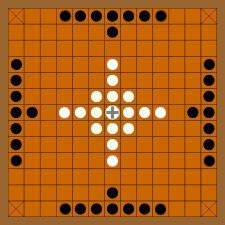 Has anyone here experimented with 13x13 tafl? I've been thinking about the reasons I prefer 11x11 to 9x9, which, in turn, I prefer to 7x7. Maybe I'd like 13x13 even more. I won't know until I try, so I'll be building a 13x13 set soon. I suppose that aside from a different starting strategy, it would turn out to be very similar to 11x11 in gameplay. The "population density" of the board would be different. In 11x11, we have about 0.31 pieces per space on the board. In 13x13, (If we still use 37 pieces) we would have about 0.22 pieces per space. This might help White more than it helps Black, as the board will be less "crowded". On the other hand, the king will have a longer distance to move to the corner. As an aside, in Tablut we have about 0.31 pieces per space, the same as in 11x11. The "population density" for 13x13 is less than any other Tafl game that I know of, except for Alea Evangelii, which has 0.20 pieces per space. A move resembling "Millar's Gambit" just wouldn't work with the 13x13 starting arrangement that I frequently see pictures of (The one with all of Whites pieces in a cross-formation). It would leave a space adjacent to the king open for a black piece to move in and block the king's progress, with little threat of capture. It would seem that if such a starting setup, it would make more sense for White to move one of the outer pieces closer to a corner to start expanding outwards. Am I right? I have modified the previous image that I posted (Originally from Wikipedia) to reflect the starting layout that we use for 11x11 Hnefatafl. I just thought it might help to have a visual to look at. I don't know why 13x13 would be set up any differently from 11x11, so I like the idea of using the same general setup. Any insights or opinions about which way might be "correct" or at least "better" are welcome. On the 9x9 board is used 24 pieces plus the king. A simple upscaling to 11x11 board requires 24 / (9*9) * (11*11) = 36 pieces plus the king. It's interesting that this is exactly what is used on the 11x11 board. 36 / (11*11) * (13*13) = 50 pieces plus the king. In tafl, the number of pieces must be divisible by 12, because the attackers must be double the number of the defenders, and all pieces must be symmetrically distributed along four edges. This would for the 13x13 board give 48 pieces: 16 whites, 32 blacks and the king. Very possibly a change of board size could also influence the balance and could require a rule change of some kind. Fx. that the king wins on the edge? This was just some thoughts. That seems logical to me. I don't know why it's usually assumed that it would still use the same number of pieces. It seems important that no white piece can reach the edge in a single move. If 13x13 is to 11x11, as 11x11 is to 9x9, then it would be amazing! I suspect though that the game dynamic will be very similar to 11x11, just a bit more drawn out. But who knows, 11x11 has thrown so many surprises and complexities at us over the years. I'm not sure how many 13x13 boards have been found, but the gokstad one has markings on that lead me to suspect it is not hnefatafl at all being that its markings have twofold symmet. Though maybe it doubled up as a tafl board. Looks more like the asian game shogi. Those vikings did get around so who knows. Alternative starting position for 13 x 13 tafl. Same number of pieces: 32 attackers (here coloured WHITE) and 16 defenders plus king. In this arrangement, there are NO open files at all, and the attackers already have control of the third ranks - I would suggest this gives them a massive advantage. Haven't played it though, but I expect it would be a very long game, like alea evangelii. Adam wrote: I suspect though that the game dynamic will be very similar to 11x11, just a bit more drawn out. crust wrote: Alternative starting position for 13 x 13 tafl. The above used simple proportional upscaling of pieces from 11x11 would for the 19x19 board require 108 pieces. But Alea Evangelii uses only 72 pieces. Furthermore the pieces are not initially ordered together, but they're scattered on the board. I guess that historical users of Hnefatafl found out that it must be like this on the large board because of balance; also perhaps the reason for the scattered initial ordering could be to reduce the game length? This way part of the opening game is skipped. The switch from 11x11 to 13x13 is a minor step towards the large boards, and so perhaps you can see the beginning of some large-board features. Fx. the scattered initial ordering mentioned by crust could be an improvement of balance, or it could be a way to reduce game length. Hagbard wrote: the reason for the scattered initial ordering perhaps could be to reduce the game length? This way part of the opening game is skipped. That's probably right. And very necessary to prevent the opening game being too tedious. The larger boards dissipate the game's "energy"... like trench warfare where the trenches are too far apart... and the mid-game starting position looks like a desperate attempt to restore that energy. Unless anyone has a thrilling alea evangelii experience to relate? Any Alea Evangelists out there? I have my doubts about playing with 32 black pieces and 16+1 white pieces. That's why I still doubt that 48 (49) piece sets were ever in common use. It's probably why most drawings of 13x13 hnefatafl use 24+12+1 pieces. As with Alea Evangelii, it's possible that the initial layout for 13x13 was spread out and less crowded. (Like Hagbard said, to skip the initial phase of the game) That would explain why a larger board could still have the same number of pieces, shortening the game by skipping a few initial captures. I've finished building a 13x13 set, but I still haven't found time to play it. College has me very busy right now, but I'll give my opinion after some test games. I know a number of people at my school who are pretty good at this game. I'd start a club for it if I were going to stay at this school. There's a chance I'll start a Tafl club after I transfer to a four-year college though. That would be fun. Beadle wrote: I have my doubts about playing with 32 black pieces and 16+1 white pieces. That's why I still doubt that 48 (49) piece sets were ever in common use. I've finished building a 13x13 set, ... I'll give my opinion after some test games. All fair points, though while you are running your test games, it would be a good idea to try with the extra pieces too, you'll soon find out if it makes a better or worse game. The Alea Evangelii evidence suggests that tafl games with many more than 32+16+1 pieces existed. No doubt less common than their simpler counterparts, but none the less real. Reason enough to try out 13x13 with an increased number of pieces. By the way, does anyone have a link or file of the oxford ms 122 manuscript with the alea evangelii text translated? The image is covered in enigmatic notation. Would love to read the text.